D.GRAY-MAN Gets New Anime in 2016! 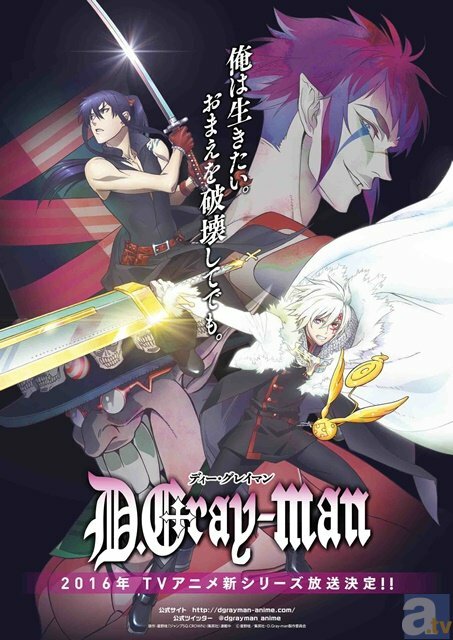 It was announced on Sunday, December 20, 2015 at the Shonen JUMPFesta event that Katsura Hoshino’s D.Gray-man manga will be receiving a new television anime series! Hoshino recently brought back the manga by releasing chapters once every three months. The original anime aired from 2006 to 2008 and lasted for 103 episodes. After the cancellation of the anime, the manga went on hiatus numerous times due to claims of plagiarism, injury to Hoshino’s hand, and Hoshino’s overall health. Sadly, Sanae Kobayashi will not be returning to reprise her role as Allen Walker. Murase Ayumu (Haikyu! Second Season) will be taking over the lead role instead. Shinnosuke Tachibana has also been cast in the role of Howard Link. The anime is slated to pick up where episode 103 ended and will serve as a continuation of the series and not a relaunch. The anime is set to air sometime in 2016, but the announcement didn’t state when in 2016 the anime will air.